Perfect for American Heart Association (AHA) scenario-based training! 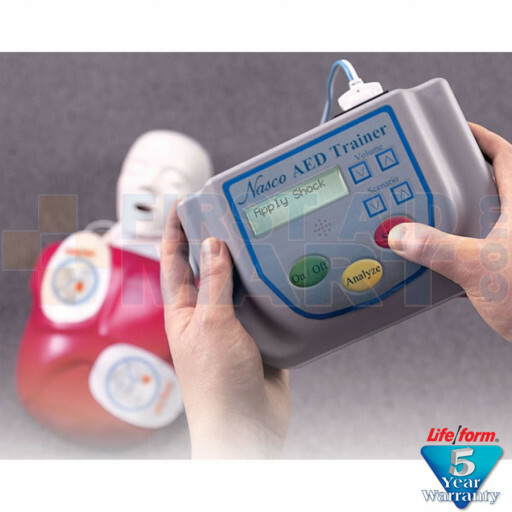 Prepare students for emergency situations with the Life/form AED Trainer. Simply push a button to set the sequence of events that will help students learn the appropriate steps to follow in both "shock" and "no shock" situations. 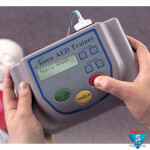 The instructor can select from eight AHA recommended AED training scenarios. Once the scenario is selected, the trainer will prompt the student in appropriate actions and responses. Lightweight, compact trainer comes with reusable pads and electrode sets, 9V battery, and user's manual (includes optional pre-planned simulations). The Basic Buddy offers a realistic and affordable way to provide each student with their own CPR manikin. The one-piece, disposable lung/mouth protection system makes this manikin completely sanitary - there is no risk of cross contamination and no need to sanitize the manikins after use! Rugged carrying bags make transporting the Basic Buddy 5-Pack and 10-Pack convenient (manikins fit into bags fully assembled). 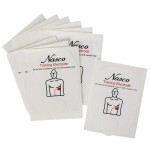 NASCO Automated External Defibrillator Trainer with Basic Buddy - LF03742U.